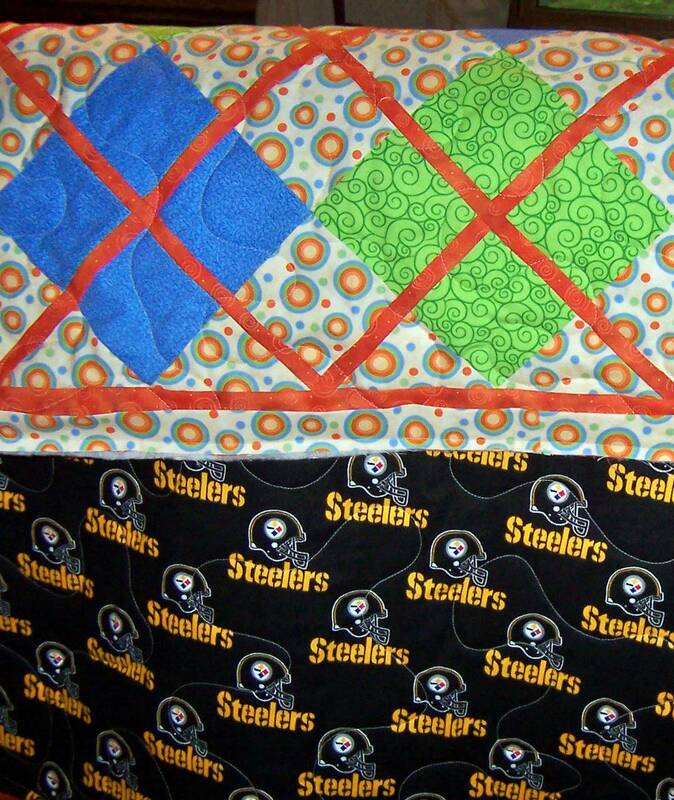 Another quilt given this week! Such a great feeling! This week the Gargoyle Quilt made its way to a new home - baby Logan, due in about a month. Logan's mom works for my hubby. Logan's dad used to work for my hubby. The hubby has become good friends with them and requested I make a baby quilt for them as soon as he found out mom was pregnant. So I looked around the internet for inspiration, borrowed a magazine of my mom's for a bit more and eventually just sat down and figured this out for myself. 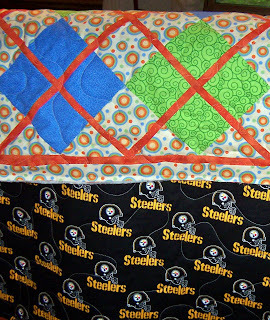 No actual pattern, but really who needs a pattern for 3" squares and 1" sashings? Mom-to-be loved it. She sent a big hug home for me with the hubby. I've been working on the cows, so I'll try to get a photo of them soon! That looks really easy. I think I am going to steal the pattern. It turned out great! Cutest gargoyle quilt I have ever seen. The colors are so perfect. Look forward to seeing your cows. Your Gargoyle quilt turned out GREAT! I REALLY like the orange sashing - it POPS nicely! I'll have to try that in one of my quilts - soon. 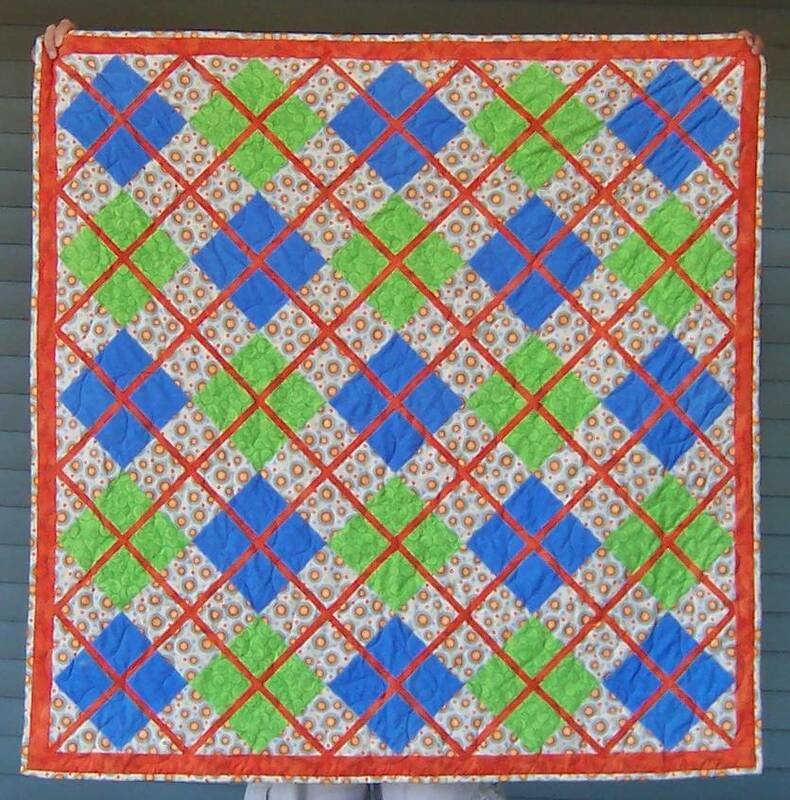 And orange in the pinwheels on your "cows" quilt might be cute, too. Just a thought. 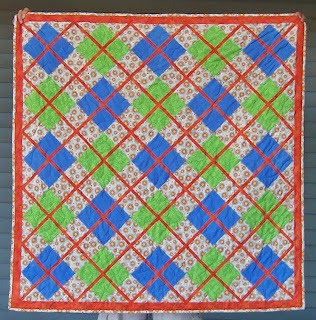 Orange is not usually my color, but I love this quilt! Have fun with the cow quilt it is adorable, too.